Sunshine Coast FC is delighted to announce we have been granted a Skill Acquisition Program (SAP) licence effective immediately. As one of the most successful youth development clubs in Queensland, Sunshine Coast FC was granted a position in the program as the clubs focus on developing youth right through to Senior football in the National Premier League. Those selected will be receiving quality coaching twice a week for the 40 week program, overseen by Technical Director Melvyn Wilkes, who has a wealth of experience in player development having overseen the youth programs at both Manchester City and West Bromwich Albion in the English Premier League (EPL) as well as working with current National team players. Wilkes said “it’s good to receive confirmation of our participation in the SAP program going forwards, I have assembled a group of highly qualified and experienced staff that will assist in the delivery and games program on a weekly basis, which will see Sunshine Coast FC back developing the very young age categories in our prestigious football club”. Sunshine Coast FC’s SAP boys Under 9’s, Under 10’s, Under 11’s and U12’s teams will compete against other clubs in the SAP games program. 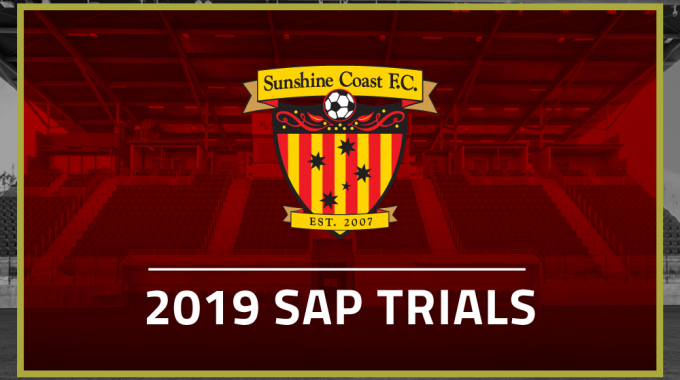 Those born in, 2010, 2009, 2008 & 2007 are invited to trial for positions in our 2019 boys SAP program, there will be 12-14 positions available per age group. Please make sure you arrive at 4.30pm to register, warm up and stretch before the trial begins at 5:00pm. Shin pads, water bottle and sunscreen is required.